Jagathon at Indiana University-Purdue University Indianapolis was recently awarded the Partnership Award at the Miracle Network Dance Marathon Leadership Conference in July. The Partnership Award recognizes the Miracle Network Dance Marathon organization and their respective partner that demonstrated the most collaborative and mutually beneficial partnership in the past year. 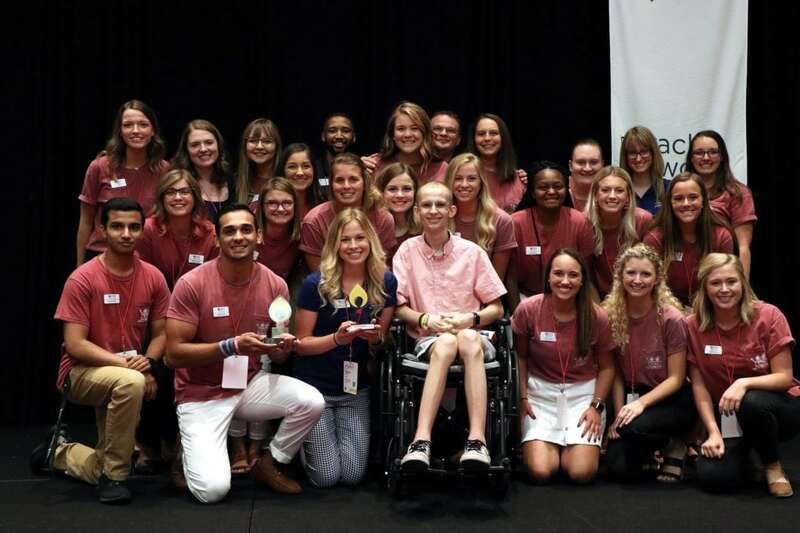 Jagathon receives the Partnership Award at DMLC 2018 in Indianapolis, Ind. from Riley Hospital for Children patient, Tyler. In 2018, Jagathon created a unique partnership with the Indiana University-Purdue University Indianapolis (IUPUI) Office of Undergraduate Admission and Jagathon’s partnering high school programs. Their vision was to generate recruitment opportunities for the IUPUI Office of Undergraduate Admission and provide monetary support to each high school program. The IUPUI Office of Undergraduate Admission sponsored each high school dance marathon with a monetary gift in the range of $500 to $1,000, designed a Snapchat filter for each individual high school, and provided an application fee waiver to any student applying to attend IUPUI. The high school dance marathons offered recruitment opportunities for the IUPUI Office of Undergraduate Admission by allowing them to table at their events. Congratulations to Whiteland High School on a fantastic year! Jagathon and Riley are so thankful for all the hard work each of these students has put in for the kids. Jagathon facilitated the relationship to help ensure all parties were benefiting from the program. The directors of each of Jagathon’s high school dance marathons worked with the IUPUI Office of Undergraduate Admission to form a individualized partnership. Overall, the results proved to create mutually beneficial outcomes for all involved. IUPUI Office of Undergraduate Admission received student information from each high school and added them to their contact lists. The high school dance marathons were given a generous contribution to their fundraising efforts and an opportunity to learn more about opportunities at IUPUI.